This is my fourth Cambridge Film Festival, which I first encouraged myself to explore after starting this blog in 2010, and this year by the morning of the first day I had a palpable sense of excitement for what was coming up. Partly that’s my involvement, which this year is reaching new levels: as well as a daily diary here, I’m also contributing a number of interviews to Take One, the Cambridge publication that runs alongside the festival, and hosting two Q & A sessions. For me it’s a thrill to be involved, but also serves to further the reason for setting up this blog originally, to attempt to get word out about the finest films showing anywhere and to encourage people to see them, and my evangelising will reach new heights over the next eleven days. But this year also marked a personal milestone, in that on day one I finally managed to get to a short film programme. I’ve taken in Tridentfest for the last two years, but for externally submitted films I’ve had tickets and then had to return them for various reasons. So it was a joy to finally be able to take in a selection of shorts, and I’m hoping I’ll get more chances throughout the festival. Here’s my breakdown of the good, the strange and the desperately unfortunate that made up day 1. This French short, running to around 25 minutes, is showing in conjunction with a number of other shorts programmes over the course of the festival. It’s difficult to get too much into plot without giving the game away, but there’s a number of sharp and sudden escalations in the plot and the viewer is left to piece together what’s happened from pieces of conversation and visual clues. By effectively stripping out any exposition and allowing the plot to drive the narrative, Just Before Losing Everything builds and maintains tension almost out of nowhere, while running parallel social commentary, and it perfectly fit the running time. It comes highly recommended if you get another chance during the course of the festival. What followed was the first of the festival’s half a dozen or so short film programmes that will run during the course of the festival, in this case seven films which each had a somewhat skewed outlook on life. Personal highlights included Our Name Is Michael Morgan, a tale of competition between two eerily similar salesmen, and Emmeline, the tale of a girl who has to overcome an unusual affliction to find happiness. Director Tim Hewitt was also in attendance for his adaptation of a Graham Greene short story A Little Place Off The Edgeware Road, and the thread also included the voiceover difficulties of A Big Deal, the a satnav with jealousy issues in Bird In A Box, the short and slightly macabre animation Menu and the tale of extreme recluse author Izzy Blue in Hermit. Overall there wasn’t a significantly weak link, and with two or three charming and provoking shorts this was a well composed programme. A slight sound issue on the first film thankfully didn’t cause too many problems. 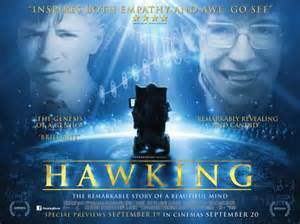 The main event of day 1 was the gala screening of the documentary Hawking with Q & A, which had not only taken over all three screens at the Cambridge Arts Picturehouse but was also being beamed live to cinemas around the country. Demand was certainly high, and five minutes before the scheduled start time I was in a queue that stretched virtually throughout the entire length of the cinema, from the screens doors through the bars and almost to the street. The documentary they were all served up is a curious beast. Although directed by Stephen Finnegan and Ben Bowie, it’s been co-written by them and Hawking himself. Hawking takes his opportunity to summarise his career achievements, from theories on the Big Bang to his partunification of various fields, but that’s all it is: a fairly thin biography that serves to eulogise its subject without ever getting below the surface. In that sense it achieves its initial aim, as Hawking wrote The Brief History Of Time not only to bring science to the masses, but to encourage the wider questioning of the fundamental aspects of the universe. Consequently, a documentary that doesn’t question anything feels violenty at odds with its subject and his philosophy, and for a pseudo-scientist such as myself it comes over as an exeperiment based on a fundamentally flawed terms of reference. This was then followed by a question and answer session that can charitably be best described as excruciating. A set of unfortunate circumstances, including Professor Hawking’s seeming movement to the wrong part of the cinema leaving him stuck when it came to his time to answer pre-recorded questions, a failure of his pre-recorded questions to answer, a set of odd questions from a bemused audience who seemingly hadn’t been briefed that they couldn’t answer Hawking any direct questions and Krishnan Guru-Murthy’s insistence on (probably unintentionally) doing his best to draw the audience’s attention to the flaws at any given point, the whole experience was the equivalent of a slow-motion car crash, enlivened only by video messages from Sheldon and Amy from The Big Bang Theory (geekgasm), Richard Branson (space advert) and Morgan Freeman (bizarre non-sequitur). To cap it off, when fellow scientist Kip Thorne was asked where Hawking sits in the scientific pantheon, he gave a very honest answer that still felt somewhat uncomplimentary in an evening desgined to celebrate the world’s most famous scientist. I don’t believe anyone at the cinema or the festival itself to have been too responsible for what happened, and it would be unfortunate if it reflected badly on them. David Gordon Green’s directorial career has followed a somewhat unusual trajectory, from the inide credibility of George Washington and All The Real Girls to the mainstream excess of Pineapple Express and Your Highness. Pineapple Express represents a meeting of minds of the two David Gordon Greens: Paul Rudd and Emile Hirsch are two highway workers wandering through a wilderness painting lines on the road and putting up posts, while they gently bicker and attempt to resolve the issues with their respective love lives (not least the fact that Rudd is dating Hirsch’s sister and has only taken him on this journey out of a feeling of loyalty). 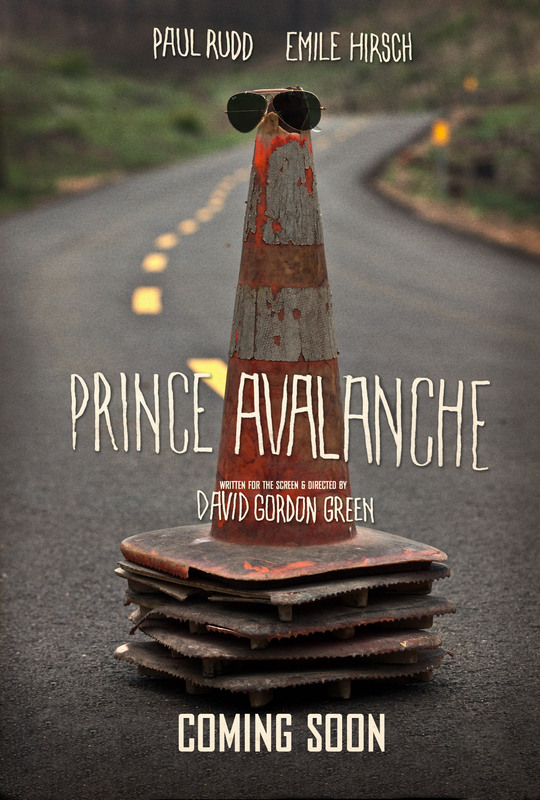 Their relationship is fractious, slightly daft and often laugh-out-loud funny, and if that was all there was to Prince Avalanche it might not be enough. But the wilderness they’re tracking through is one devastated by wildfire and their encounters with some of the other residents of the wilderness add a resonance and a sweetly melancholic tone. It’s also lovely to see a great performance from Lance LeGault, remembered by anyone my age and sensibility as Colonel Decker from The A-Team in what turned out to be one of his last roles; the film is dedicated to his memory. It’s a fine achievement by Green, bittersweet and roughly honest with itself and beautifully shot in the washed out residue of the American wild. Coming soon: day 2, with my reviews of Mushrooming, Particle Fever and The Crash Reel. This entry was posted in Cambridge Film Festival, Reviews and tagged 2013, Cambridge, Cambridge Film Festival, film, Hawking, Just Before Losing Everything, movies, Prince Avalanche, review.